God, furthermore, said to Moses, “Thus you shall say to the sons of Israel, ‘The Lord, the God of your fathers, the God of Abraham, the God of Isaac, and the God of Jacob, has sent me to you.’ This is My name forever, and this is My memorial-name to all generations. Go and gather the elders of Israel together and say to them, ‘The Lord, the God of your fathers, the God of Abraham, Isaac and Jacob, has appeared to me, saying, “I am indeed concerned about you and what has been done to you in Egypt. I AM. It is God's name. Arguably translated: Jehovah. This is the name of God. Note that this is the only name of God which is not related to what He does. This is God's special name that reveals WHO HE IS. It is the name assigned to the "all changing unchanged one" to quote John Donne. It is an all-encompassing name for an all-powerful God of all things. Yet, here is the most tender of all the things that He is: He is indeed concerned about you. Stop and consider that a while. This passage, well known for the image of the Burning Bush, is commonly referenced as a high place of God in all his power. He calls Moses and sends him to Pharaoh. He yells at Moses for acting cowardly. He talks of all the wonders that He will perform to prove His authority over Egypt. But right in the midst of all this machismo, God has a tender moment. He is concerned about His people. This is the unchanging God we are talking about. Indeed, He is still concerned about His people. 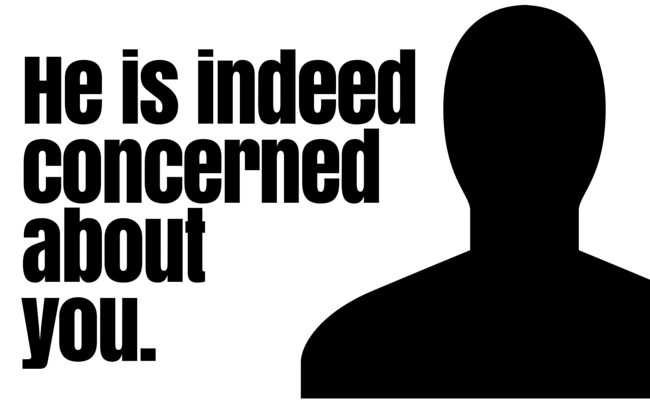 He is concerned about you. He wants to deliver you. Are you still in peril today? He is indeed concerned about you.